THANK YOU ,for a great holiday ,clean ,food really good,10mtrs from the beach,the staff really make youre holiday enjoyable,a real great package.would love to return earlier in the year next time [weather cooler in oct].thanks again DIMITRIOS.love from EILEEN n ROB room 221. Have just returned from what I can only describe as 2 weeks in heaven. Dimitri & Dena, who have owned the hotel for over 20 year, along with their son Spiros, made us feel as if we were long lost family. Their welcome was tremendous. The rooms although being a bit on the small side were very clean. Think its possibly the size on the rooms that stops the hotel getting a better star rating. Should definately be 4 or 5 star. The gardens were beautiful, Dena, works very hard to keep them under control. All the staff were wonderful. just couldn't do enough for you. Whether you were sitting round the pool and jacuzzi area or in the bar or dining room. Dimitri and Spiros entertained the guests everynight, from quizzes, pool competitions and discos. 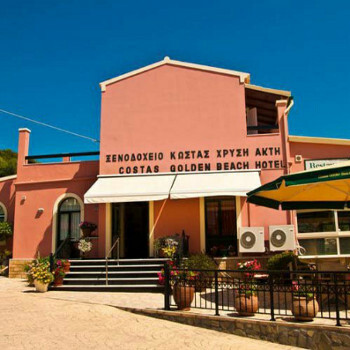 This is second time have stayed at Costas and we were not dissappointed on either occasion, we found Dimitri, Dena ,Spiros and all the staff to be over the moon to see you, be it on your first or subsequent visits they even remember your names and favorite drinks... amazing!! Location is brilliant right next to the beach which is clean and accessible, some sports to be found include surfing and pedalos etc. the hotel is a real gem, the pool is very well looked after as are all the facilities... garden in particular is the result of Dena's hard work in even the hottest weather.The food is fantastic and you won't come away without piling on some extra weight.People do visit from along the resort to eat also at Costas and I can't blame them.Be warned that Dimi is probably the best dj in the world also!!! We have very happy memories of the hotel and people and are definintely visiting again....soon. The hotel was almost directly on the beach, except for a small road in front of the hotel. It was very clean and very friendly. The manager, his wife and staff could not do enough for you and the food was plentiful and very good. We went during world cup season so the entertainment was brilliant. Well done. We had not beem to Greece before so did not know what to expect, we were very pleasantly surprised. The owners dimitre and his lovely wife dinar could not do enough for you. The same goes for all the staff they were really friendly and helpful. We will defenitly be going back soon. This was a fantastic holiday. Demetri the owner well what can I say. What a lovely friendly guy and his wife she was one in a million. Nothing was to much trouble whatever you wanted you had. The pool was lovely, surroundings lovely. Service was good, food and rink on tap. The entertainment was great. Outside of the hotle is the beach which is a bit stoney but very nice, you must get snorkelling gear, the fish you will see swimming around your feet is wonderful, we will go back without a shadow of a doubt. Lovely hotel. Stroll out of the front, over a small road and onto the beach, which is large and uncrowded even in August. The Hotel is good but what makes it really good are the people. The staff are great, the owners are great, they really look after their guests. It's a happy hotel, the other guests there all talked to each other and many of them were on a repeat visit. The food is good, the hotel is clean and we've already booked for next year.